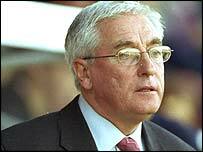 Wrexham caretaker manager Brian Carey has asked Wales assistant Roy Evans to help the club's relegation fight. "Roy's one of many people I've spoken to for advice, now he'll continue in more of a hands-on role," said Carey. "It will be on an informal, part-time basis. I've always said this is not about me or any individual, it's about the league survival of the club." Ex-Liverpool manager Evans' experience could be vital, Wrexham yet to win in Carey's seven games in charge. Sunday's 0-0 draw with Chester saw the Dragons climb out of the relegation zone on goal difference. "You can argue it was a good result but I'm disappointed, we need to be winning these kind of games," Carey told BBC Sport Wales. "It does give us something to build on in terms of performance, but we're in the results business. "It's not easy waiting for your first three points as manager, but we must continue to believe in ourselves." Wrexham's next league test come on Tuesday night, when the Dragons travel to Blundell Park to face Grimsby.